Pallet surfing may sound like fun but in reality, it can be dangerous stuff. In the world of roller pallet flow rack systems, we work very hard to ensure that loaded pallets flow steady and controlled down the lane. Pallet surfing occurs when a pallet flows too fast, defects, tracks improperly down the lane and/or doesn’t come to a controlled and steady stop. In our experience plastic pallets are often voted Most Likely to Surf, but other pallet styles with limited surface area on the bottom could also be prone to skidding and sliding. Thankfully, Mallard has a new product that should put an end to this uncontrolled behavior for trickier pallets. The Ultra-Grip Roller is a full-width roller with a texturized rubber coating. The roller is mounted within the full roller pallet flow lane at specific intervals determined by pallet dimension and weight. The rollers are mounted in pairs, but we don’t stop there… Ultra-Grip Rollers are designed to work in conjunction with Mallard’s indirect mount speed controllers. 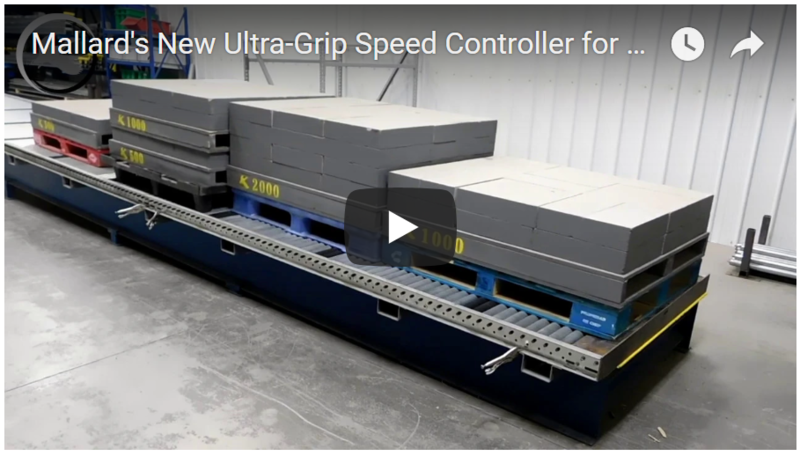 The speed controllers are mounted underneath the pallet flow lane and fitted directly between the two grip rollers. 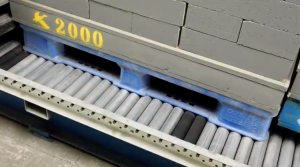 The rubber surface of the speed controller meets with the rubber surfaces of the grip rollers and, voilà the braking mechanism is activated to slow pallets that would ordinarily skid over the galvanized roller surface. Mallard has tested lightweight pallets from 500# to heavyweight pallets up to 2000# with positive results, and we are ready to test your pallet loads. If you are using plastic or non-standard GMA-style pallets, let’s test your pallets in our in-house testing lab. 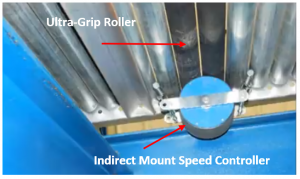 The best way to show the significant improvement in function and reliability in your pallet flow lane is to see it compared on a lane equipped with the Ultra-Grip Roller & indirect mount speed controller pairing vs one without… and we can make that happen. Give us a call today to schedule your customized pallet flow test.